Jasper came to Kindred Spirits Care Farm when he was just a few days old. He was born the runt of triplets, but was too small and weak to get up and follow his mother and siblings back to the barn. The man who was overseeing the flock didn’t have time for a “bummer lamb”, and was going to leave Jasper in the field to die. Lucky for all of us, a compassionate lady was riding her horse past the field, convinced the farmer to let her take little Jasper, and arranged for him to live at our sanctuary. Even though Jasper lives with the flock, his favorite thing is to spend time with people. He is an amazing animal ambassador, teaching people how loving and affectionate farm animals can be. Won’t you help Jasper continue his efforts to teach humankind how wonderful all animals are? Freckles was living in a flock of sheep being kept by a man who intended to eat them. He let his sheep breed at will and soon his flock was “too big” and he wanted to get rid of some. Lucky for us, we found out in time to rescue Freckles and her son. Now they live in safety, assured that they will never be in danger of being eaten. Freckles is a good mother, and a curious and gentle soul. She is especially fond of dried cranberries. How would you like to show Freckles that she is a loved and valued member of this world? Lily spent her early life as part of a meat herd, constantly pregnant and giving birth only to see her babies mysteriously disappear. However, a lucky chance brought her to our farm sanctuary. When she first arrived, the vet told us she was going to have one lamb, but to our surprise she had three beautiful babies! Lily takes her maternal duties very seriously, protecting her children and the rest of the flock. Would you like to sponsor Lily to help her keep the flock safe and sound? Susie is very bonded to her mother, Lily, and can always be found by her side. 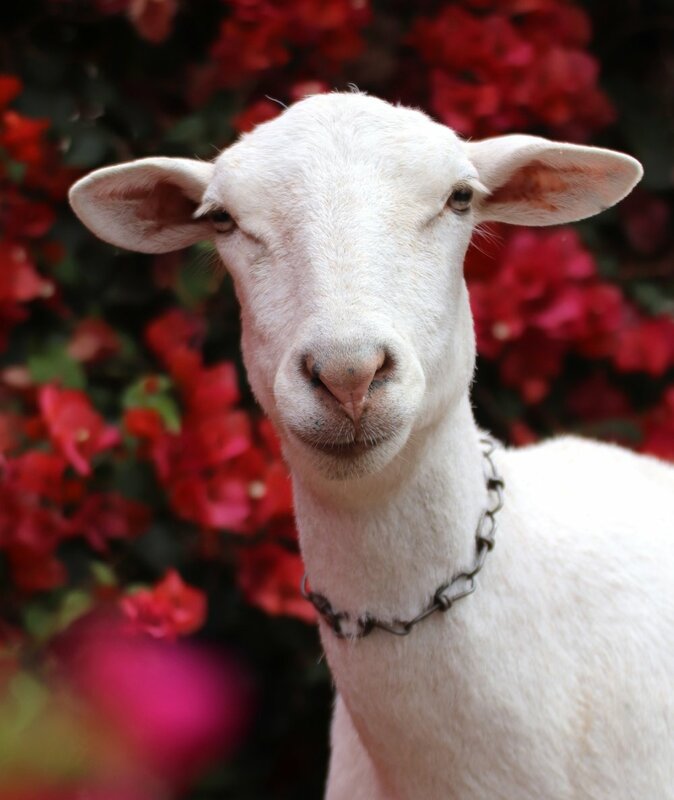 Susie was born at the sanctuary and has only ever known love, safety and respect. She is a wonderful example for the students, demonstrating how quickly a healthy sheep matures. 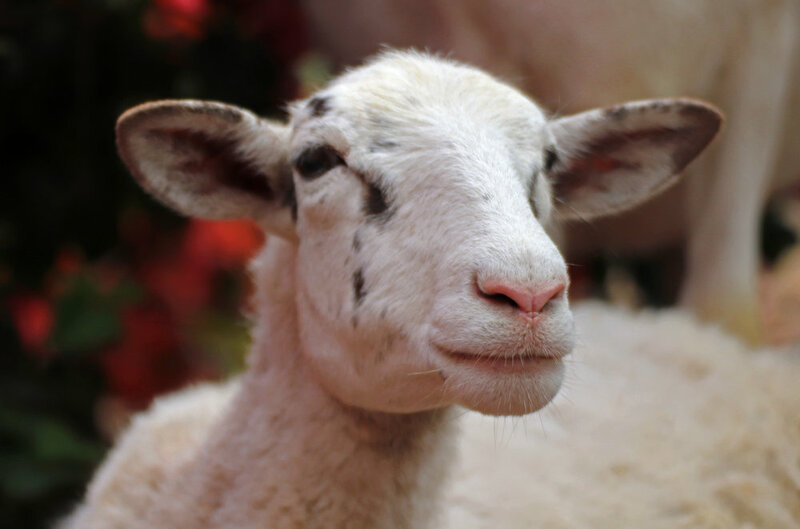 Sponsor Susie today to help her continue teaching the students about the spirit and intelligence of sheep. Dan is Lily’s only living son, and is growing up big strong to protect his mother and sisters. But Dan needed a little help to get there. When Dan was just a few days old, his mom Lily had a plugged teat and Dan could not get enough milk. Fortunately, we were able to supplement his diet with formula to help him get the nutrition he needed to thrive. This extra attention not only helped Dan grow, but also helped him become familiar with human people. A sponsorship for Dan will help him continue to win friends and influence everyone’s opinion of farmed animals. Jenny is the proverbial “black sheep” of Lily’s family. She was the runt of the litter, and was too small to push her way past her brother and sister to get Lily’s milk. Just 12 hours after she was born, Jenny started to fail. So we made the decision to raise her as a bottle baby. Every 90 min, for the first few months of her life, Jenny needed to drink from a bottle. But it worked wonders. By the time she was weaned, she was actually bigger that her siblings. Please sponsor Jenny to show that everyone deserves a fighting chance at life.